During this voyage, a peculiar and strange event happened to Timoleon. Heaven came to the support of his venture and foretold his coming fame and the glory of his achievements, for all through the night he was preceded by a torch blazing in the sky up to the moment when the squadron made harbour in Italy. Translated by C. H. Oldfather. Translated by the Rev. Canon Roberts​. Many signs also appeared, most of which were of the ordinary kind; but from Ameria and Tuder, cities of Italy, it was reported that at night there had been seen in the heavens flaming spears, and shields which at first moved in different directions, and then clashed together, assuming the formations and movements of men in battle, and finally some of them would give way, while others pressed on in pursuit, and all streamed away to the westward. In Spoletium a gold-colored ball of fire rolled down to the ground and, becoming larger, appeared to be carried off from the ground toward the east, concealing the sun with its magnitude. Truly, during the nighttime terrible armies in battle lines preceded this calamity, red with human blood and burning with the pallor of fire. Premonitions of this disaster were believed to have been seen many times in the sky, armies in battle lines and their terrible nocturnal flashing as they dashed about in the air. This year, on the Sunday before the Feast of Saint John the Baptist, after the sun had set, in the luna prima [i.e., the first quarter moon], a marvelous sign appeared to five or more men sitting turned toward it. For the new moon was bright, as was usual in its newness; its horns stretched out to the east, and behold suddenly the upper horn was divided in two. From the middle of this division sprang a burning torch, throwing flames, coals, and sparks down a long way. Meanwhile, the body of the moon, which was lower, twisted as though disturbed, and to use the words of those who reported this to me, and had seen it with their own eyes, the moon pulsated like a beaten snake. After this it returned to its proper state. This change was repeated a dozen times and more besides, and the flame could be seen sustaining various torturous shapes, like the one mentioned before, and again returning to its prior state. And after these changes, (the moon) certainly was made half-black all along its length from horn to horn. The men who saw this with their own eyes reported to me that which I write, preparing to swear under oath and by their faith, in addition that they have added nothing false. In the same year, on the eve of the feast of St. James, about dusk, before the stars had appeared, was seen in a clear blue sky, a very large star like a torch, which rose from the south, and flying along, not upwards, darted through the air, making its way towards the north, not swiftly, but as a hawk usually flies: when it had reached the middle of the firmament, which is in our hemisphere, it vanished, leaving, however, smoke and sparks in the air. This star was either a comet or a dragon, greater to the eye than Lucifer, having the form of a mullet, very bright at the foremost part of it, but at the hind part smoky and sparkling. All who saw this wonderful sign were struck with wonder, and did not know what it portended, but one thing is certain, that after the crops had been almost all choked by the protracted rains, the season was at this very hour changed into one of a most remarkable fertility, and preserved the ripe crops, which were only waiting for the sickle, and allowed them to be gathered in. And note that this battle and massacre, which took place between the Genovese and Pisans, was foretold and revealed a long time before it had occurred; for, in the town of San Ruffino, in the bishopric of Parma, women, who by night were cleaning flax, saw two great stars doing battle with one another. They withdrew after many exchanges, and they fought each other again and again in many clashes. On the fourth day of November, in the first hour of the night, in the western area outside the city of London, near the village of Ruystebrugge (Uxbridge? ), many miraculous signs appeared in the sky to onlookers. For a fiery funeral pyre of the size and form of a small ship, pale and grayish in color however, rose up from the south, crossed the sky with a slow and ponderous motion, and turned its path to the north. From this burning pyre burst forth a different very hot fire of red color and a greater magnitude, though proceeding from a form not dissimilar, sowing flames and running off through the air with great fury. And by turns approaching each other, with their numerous collisions a dire battle commenced, from which battle echoing sounds were heard by observers from a great distance, though it was not possible to discern the form of any living things whatsoever. Thus fighting among themselves for a long time, the northern pyre defeated the southern pyre, and the defeated one escaped to the south, from which it had come, taking a long time, and it was no longer visible. But the northern pyre, on the shore from which it was departing, at once kept itself back. ​There are some Christians now alive who were with the Marquis Don Francisco Pizarro when he seized Atahualpa in the province of Caxamarca, and they saw a green sign in the sky, in the middle of the night, as broad as a cubit, and as long as a lance. When Atahualpa heard that the Spaniards were looking at it, he requested that he also might be allowed to see it; and when he beheld it, he became very sad, and continued so during the next day. The governor Don Francisco Pizarro asked him why he continued to be so sad, and he replied, “I have seen a sign in the sky, and I tell you that when my father, Huayna Ccapac, died he saw a similar sign.” Within fifteen days Atahualpa was dead. (folio 315v) Twenty days later Atabalipa died, not knowing than an army was waiting. Atabalipa had spent a very cheerful evening talking to some Spaniards, and there appeared in the air near the city of Cusco a comet of fire, which stayed most of the night, and when Atabalipa had seen it he said: “Soon there will die a lord of this country.” And that was him. At last, in total despair, they said that, among other signs, there appeared in the sky a dark green comet, slightly less thick than the body of a man, and longer than a pike, which that night looked like the one he saw shortly before the death of his father, Huayna Capac. In the evening, about one hour into the night, there appeared very clearly to the right of the army, just before they departed, a stripe (listra) of fire in the form of a half-moon, which seemed to fall and disappeared very suddenly. Heaven was very serene, a vigorous north wind purged it of every cloud, and here in the middle of the air a flame of fire appeared so great and clear in the form of a burning column. And for a long time it was seen by all with wonder. What wonders, O God, that these are overt signs of the heavenly protection of the faithful people! Who reading happily what happened shortly afterward does not know and confess that, as with the beloved people of Israel, so too were the armed Christians preceded by God in the form of a column of fire? In the town of Altorf in the country of Wurttemberg in Germany, one league away from the town of Tübingen, on the fifth day of last December, in the year 1577, at around seven o’clock in the morning, when the sun was beginning to rise, there was seen not its natural brightness and splendor… All around the sun there appeared many black clouds, of the kind we are accustomed to see when there is a great storm, and soon after there came from the sun other clouds, all bloody and fiery, and others as yellow as saffron. From these clouds emerged diffusions of light resembling great high and wide hats, and all the earth showed itself to be yellow and bloody, and seemed to be covered (?) in hats, high and large. These hats appeared in many colors, such as red, blue, green, and for the most part black. 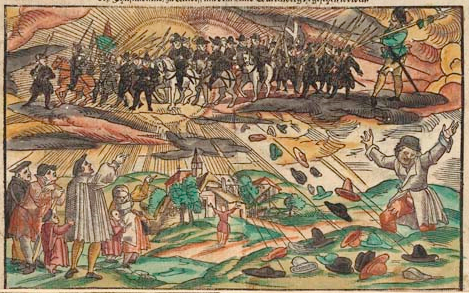 The invasion of glowing hats, Schrockliche Newe Zeitung, 1578. The Devil in the likeness of a Bishop appeared to a Scholar in Magdalen College, November 10, 1660. By a letter from a very good hand from Magdalen College in Oxford, it is certified, that about the 10th of November last, 1660, a Spectrum appeared to one Allen of that College, which according to his own relation was as followeth: He heard in the night, when he was in bed, a noise like the noise of geese; he arose from his bed, and looked out at his window, which opened over the bridge, but saw nothing; but, going to his bed again, he saw a man as it were grovelling upon the floor in Pontificalibus, attired like a Bishop in his lawn sleeves. At first he was not much affrighted, but called to it, and adjured it to speak; the Bishop immediately rose up, and approached towards his bed, at which the young man was exceedingly terrified, and crying out, murder! murder! it vanished: he since says that he saw and heard something, which he will discover to none. Upon the report of this strange apparition in the College, the next night five or six Scholars watched in that chamber, and about midnight, on a sudden, the candles went out, and immediately upon it was heard a great noise as of children crying out, which so affrighted them, that they all ran out of the chamber. This is a thing generally known and talked of by the Students in that House, though, as it is reported, the Vice-President did his uttermost to suppress the rumour of it, and by his menaces hath so awed the Scholar, that except it be to some special confidents he dares not own this to any.